In legal terms, who owns the placenta? What are the potential risks of placentophagy? What is the possible benefit of placentophagia? The use of placenta preparations as an individual puerperal remedy can be traced back to historical, traditional practices in Western and Asian medicine. 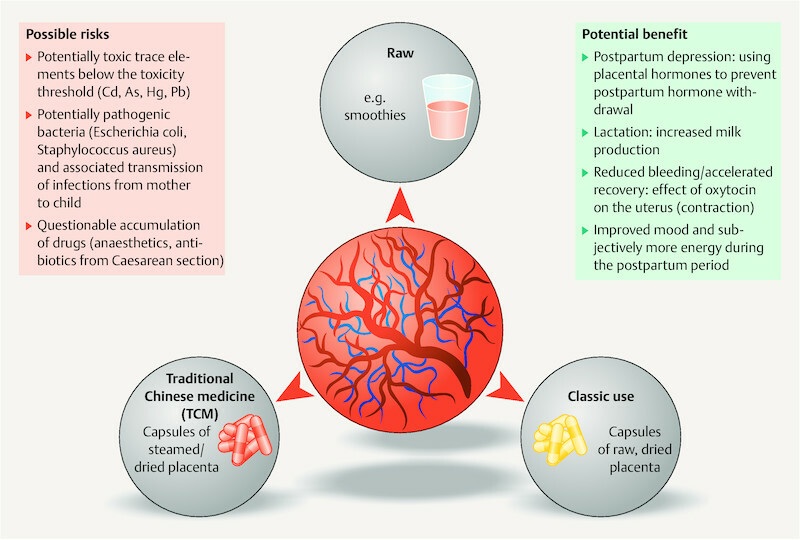 To evaluate the ingestion of processed placenta as a puerperal remedy, the potential risks (trace elements, microorganisms) and possible benefit (hormones in the placental tissue) of such a practice are discussed in this article based on a literature review. Originating in the USA, a trend has been observed among mothers in industrialized nations towards consuming their own, processed placenta as a puerperal remedy. There has been little systematic investigation into the associated benefit and potential risks, however. Obstetricians and pediatricians are faced with an increasing demand from patients, but general recommendations on placentophagy founded upon scientific data have yet to be produced. Maternal human placentophagy describes the practice of ingesting oneʼs own placenta post partum , which is done in different ways: either a piece of raw placenta is consumed immediately after parturition, or the tissue is heated, dried and then pulverized. Placenta encapsulation, whereby the placenta is processed into capsules, is a common practice in the Anglo-American world. It entails the filling of placental tissue as a dried powder into gelatin capsules for everyday consumption  ([Fig. 1]). Placenta capsules have to be destinguished from placental auto-nosodes produced in pharmacies according to the specifications of the homeopathic pharmacopoeia. Fig. 1 Options for placenta processing and ingestion and potential risk and possible benefits of placentophagy. A systematic search for literature was conducted in PubMed and the Web of Science Core Collection databases using the keywords “placentophagy”, “placentophagia”, “human placentophagy”, “maternal placentophagy” and “placenta encapsulation”. English-language studies focusing on human placentophagy published between 1918 and 2018, and animal studies relevant to clinical assessment, were included ([Table 1]). In addition, a selective review of gynaecological, anthropological and legal literature was undertaken. Table 1 Overview of selected publications on placentophagia and their results. Hammett 1917 : The effect of the ingestion of desiccated placenta on the variations in the composition of human milk during the first eleven days after parturition. The percentage of protein and lactose contained in breast milk increased after ingestion of desiccated placenta. Hammett 1918 : The effect of the maternal ingestion of desiccated placenta upon the rate of growth of breast-fed infants. Weight gain in infants breast-fed exclusively by mothers having ingested desiccated placenta was faster than in the control group where placenta was not consumed. Soykova-Pachnerova 1954 : Placenta as a Lactagogon. The hormones found in dehydrated placenta caused increased milk production in 86.2% of women (n = 181); placentophagy as a therapeutic option in hypogalactia. Selander 2013 : Human maternal placentophagy: a survey of self-reported motivations and experiences associated with placenta consumption. Women (n = 189) describe the following benefits after placentophagy: improved postnatal mood, more energy, increased milk production, reduced bleeding and faster recovery. Gryder 2017 : Effects of Human Maternal Placentophagy on Maternal Postpartum Iron Status: A Randomized, Double-Blind, Placebo-Controlled Pilot Study. Placentophagy neither positively nor negatively influences postpartum maternal iron status. Placenta capsules are not an adequate treatment for postpartum anaemia. Young 2017 : Effects of placentophagy on maternal salivary hormones: A pilot trial, part 1. The ingestion of steamed, dried placenta leads to minor yet significant changes in the womenʼs hormone profiles. Young 2017 : Placentophagyʼs effects on mood, bonding, and fatigue: A pilot trial, part 2. The ingestion of steamed, dried placenta does not significantly alter maternal mood, bonding or fatigue. Benyshek 2018 : Placentophagy among women planning community births in the United States: Frequency, rationale, and associated neonatal outcomes. Almost one third of mothers from community birth ingest their placenta post partum; in 73%, the reason to do so is avoidance of PPD. There is no evidence that the neonate is at increased risk from maternal placentophagy. Fertilisation leads to the development of the blastocyst, which consists of the embryoblast (cell mass from which the embryo develops) and trophoblast (from which the fetal membranes and fetal elements of the placenta develop). The embryonic pole of the blastocyst is connected to the endometrium of the uterus during implantation and completely penetrates the maternal connective tissue, where there is a plentiful supply of blood. The placenta begins to develop once the endometrium starts exerting metabolic and secretory activity in response to the presence of the blastocyst. The syncytiotrophoblast develops from the outer layer of the blastocyst and is the basis for development of the placenta. A close connection between the maternal and embryonal blood circulation facilitates the exchange of gases and metabolites by diffusion. This does not result in direct contact between the maternal and fetal blood – functions as a barrier, regulating the passage of substances. The physiological role of the placenta during pregnancy is extremely complex: metabolism, excretion, respiration and immunological processes such as hormone synthesis ensure and regulate the survival and growth of the fetus and the adaptation of the motherʼs body to pregnancy and childbirth. Hormones such as oxytocin, human placental lactogen, progesterone, oestrogens and neurohormones such as thyroid-stimulating hormone (TSH), adrenocorticotropic hormone (ACTH) and corticotropin-releasing hormone (CRH), some of them are produced exponentially during pregnancy . The hormonal activity of the fetoplacental unit at the end of pregnancy can be summarised as follows: The production of fetal cortisol stimulates placental CRH secretion. The elevated CRH concentration in the maternal blood stimulates the further secretion of CRH, ACTH and cortisol. Progesterone, which around the time of parturition is synthesised in the placenta at a daily production rate of approximately 300 mg , is used by the fetus as a precursor for producing glucocorticoids and mineralocorticoids. Shortly before parturition, the progesterone concentration reaches a plateau. Fetal DHEA and DHEA-S is converted in the placenta to estrogens; hence, the estrogen-progesterone gradient shifts towards the end of pregnancy, resulting in estrogen dominance . After delivery of the placenta, the concentration of placental hormones drops very rapidly. Massive hormone withdrawal is the result. The ingestion of the afterbirth, consisting of the placenta, amnion and amniotic fluid, immediately after parturition is a behaviour ubiquitous in mammals . This applies equally to herbivores and carnivores as well as nidifugous and nidicolous birds. More than 4000 species of mammals consume their placenta; only in humans and camelids has it been noted that the afterbirth is not routinely ingested . Placentophagia relates to afterbirth consumptions by animals, placentophagy refers to the human practice . Two hypotheses attempt to explain the behaviour behind placentophagia: keeping the nest clean and predator avoidance. These theories are contestable, however . For example, mammals such as tree squirrels that give birth in trees also consume their placenta rather than discarding it from the nest on the grounds of cleanliness. In various cloven-hoofed animals of the horse family, placentophagia does not significantly alter the mortality rate in the offspring. It is therefore assumed that placentophagia has no influence on the avoidance of predators . The discussion of whether there is an evolutionary biological explanation for placentophagy in humans is inconclusive , . Placentophagy is widespread among apes and non-human primates. This suggests that placentophagy in humans is a tradition that was lost with evolution . There are diverse reports of traditional cultures and different ethnicities who consumed placenta raw, cooked, or dried and pulverised . Since the 1970s a trend has been observed, starting in the USA, with respect to processing and consuming oneʼs own placenta . The desire for a natural lifestyle and an individual, self-determined approach to childbirth, associated with an interest in placenta-based remedies, has been described . As eating oneʼs own placenta is considered a social taboo, placentophagy is frequently practiced unofficially and seldom communicated. Whereas ingestion of the placenta in the animal world is certainly of nutritional benefit, it can be assumed that women in industrialized nations who have just given birth have access to a varied, healthy diet. Given its composition, therefore, dried placenta can be regarded as a nutritional supplement. In mice, ingestion of the placenta resulted in increased serum prolactin and decreased serum progesterone levels compared to the non-placenta group . Similarly, there have been reports of lactation being triggered in mammals acting as wet nurses following the ingestion of placenta . The existence of a factor that influences pain processing after placenta ingestion was investigated in the rat model . Opioid-mediated analgesia was potentiated by a placental opioid enhancing factor (POEF). In addition, the onset of so-called maternal behaviour towards the offspring was accelerated in the animals of the placentophagia group . A historical study from 1918 describes the influence of desiccated placenta on lactation: increased amounts of protein and lactose were thereby measured in the breast milk . Weight gain was also more rapid in the babies breast-fed exclusively by the mothers in the placenta ingestion group . Further benefits reported from the ingestion of placenta capsules are a stable mood post partum, faster convalescence following parturition, increased milk production, and a subjective feeling of having “more energy” post partum . Some recent reviews , , , , placebo-controlled, double-blind studies , ,  and historical publications ,  related primarily to the content of trace elements and hormones in placental preparations offer indications for clinical assessment. In the USA, almost a third of all mothers from community birth ingest the placenta either raw or dried: in more than 70% of cases, prevention of postpartum depression is given as the reason . A single placenta weighing 450 g contains an average of 234 calories, 4 g of fat, 899 mg of cholesterol, 513 g of sodium, 48 g of protein, plus significant quantities of the trace elements iron and selenium  along with calcium, copper, magnesium, phosphorus, potassium and zinc . Furthermore, it contains the essential and non-essential amino acids alanine, aspartic acid, arginine, histidine, leucine, lysine, phenylalanine, proline, tyrosine, tryptophan, and valine, as well as vitamins B1, B2, B5, B6, B7, B9, B12. Cytokines and growth factors (e.g. G-CSF, GM-CSF) are likewise found in the placenta, facilitating intracellular endocrine and paracrine signalling and thus regulating the growth, proliferation, migration and differentiation of cells . In traditional Chinese medicine, dehydrated placenta powder is used to stimulate lactation as well as treat fertility disorders among a host of other ailments . In Argentina, native ethnic groups use the powder of the dried umbilical cord to treat sick children; the indigenous Kol people of central India use the placenta as a remedy for improving reproductive function . Aside from taking placenta extracts orally, they can also be injected – offering an anti-inflammatory effect, for instance, in polyarthritis  or a regenerative and growth-promoting effect on nerve lesions . The use of placental or amniotic preparations has likewise been described in ophthalmology, for burns and wound-healing disorders . Dehydrated placenta powder contains the essential trace elements iron (mean value 565.0 mg/kg) and selenium (mean value 850.0 µg/kg) . The intake of placenta capsules does not suffice, however, to adequately treat postpartum anaemia and in one randomised, placebo-controlled, double-blind clinical study it also effected no significant change in the maternal iron status . Very low concentrations of the potentially toxic elements such as arsenic, lead, cadmium and mercury were found and were below the toxicity threshold , . Placental tissue contains various hormones, including oxytocin, estrogens, progesterone, human placental lactogen, ACTH and CRH. These hormones were detected both in raw placenta and in the dehydrated powder , . The hormone concentrations are drastically reduced by steaming and dehydration, however . Distinct effects on maternal bonding, fatigue and mood post partum were not demonstrated in one randomised, placebo-controlled, double-blind clinical pilot study (n = 27) after steamed and dehydrated placental tissue was consumed . The intake of placenta capsules in this study led to a minor yet significant change in the maternal hormonal status . Though it was long assumed that the placenta remains sterile in the womb, recent studies demonstrate a similarity between the microbiological composition of the oral cavity and the placenta. The latter has its own microbiome of non-pathogenic symbiotic microbiota such as Firmicutes, Tenericutes, Proteobacteria, Bacteroidetes and Fusobacteria phyla . It is assumed that during pregnancy bacteria from the maternal gastrointestinal tract pass through the placenta to the fetus . A single case published by the American Center for Disease Control describes a late-onset infection in a neonate from group B streptococci (GBS) . The mother had consumed her own placenta post partum in the form of capsules. Group B streptococci were identified both in the dried placental tissue and the blood of the newborn infant, but not in the breast milk. In case of maternal, oral ingestion it is assumed that the stomach functions as a barrier against bacteria, including streptococci. The maternal intake of placenta as a route for infection is therefore debatable. Prenatal transmission of bacteria, colonization of the maternal gastrointestinal tract with GBS, and transmission due to close postpartum contact between mother and child, can more likely be assumed in this case. As placental tissue is not sterile, contamination from potentially pathogenic microorganisms cannot be ruled out. Dehydrating the tissue at over 54 degrees Celsius leads to a significantly reduced number of microbiological species and eliminates Candida albicans . Whereas separating the maternal and fetal tissue of the placenta is not possible macroscopically, it can be done in legal terms: the maternal part of the placenta belongs to the mother and must therefore be handed over to her by the maternity unit if requested. According to prevailing legal opinion in Germany, a separated body part remains the property of the person from whom it has been taken. Along these lines, the fetal part of the placenta thus belongs to the newborn baby (as does the umbilical cord) given that it is attributable to the infantʼs body. Mother and father may determine what happens to it, in the interest of the child, and therefore also demand that it be released by the hospital . The processing of a placenta to powder is described in traditional European and Asian pharmaceutical compendia , . Organizations that have specialized in producing capsules from placenta (placenta encapsulation) employ standardized protocols in which hygiene measures and processing steps are specified . Processing usually takes place in a clean kitchen under semi-sterile conditions. The placenta is processed within a few hours after parturition. Firstly, it is cleaned under cold running water and removed of blood and blood clots. The organ is then cut with scissors into slices 0.5 cm thick; during this process, the fetal membranes and umbilical cord are often removed. The slices are then dried in a dehydrator for eight hours at 54 degrees Celsius . Thereafter, the dehydrated slices are minced in a food processor to produce a powder that is filled into gelatin capsules (filled volume approximately 500 mg). Reports describe that two capsules are taken three times a day during the first 14 days post partum, corresponding to approximately 3000 mg placenta powder daily. The content of various hormones in the placental tissue has been demonstrated both before and after production of the powder , . Based on knowledge so far, it must be assumed that proteolysis takes place in the gastrointestinal tract. This has an influence on the structure of the protein hormones and, in turn, their availability . If absorbed through oral mucosa, an effect from the hormones can be hypothezised due to bypassing the first-pass effect of the liver . This may be the case for oxytocin, a relatively small protein hormone (length of 9 amino acids) that can be applied in obstetrics through the mucosa and exhibits a rapid central effect (for example, nasal “Syntocin” for lactation disorders) . As a hormone that stimulates milk production and has anxiolytic and sedative effects, human placental lactogen could help improve postpartum well-being and be effective in case of insufficient lactation . The theories concerning the hormonal activity of placenta preparations have not yet been adequately explored by clinical studies, however. The hormone concentrations measured in the individual placentas vary considerably. Hence, no statement can be made with respect to the individual composition of the constituents and content of active substances . Factors that could influence the individual hormone concentrations are the duration of pregnancy and the associated endocrine activity of the placenta, mode of delivery, stress, interventions, and use of medication. A viral or bacterial infection in the mother and/or neonate is a contraindication to placenta ingestion . Likewise, the placenta should not be consumed following a general anaesthetic as it may have absorbed opioids and other anaesthetic agents. Smoking during pregnancy increases the concentration of cadmium in the placental tissue  and thus also poses a risk in case of ingestion. The intake of placenta preparations in the presence of mastitis and/or blocked ducts is likewise contraindicated due to the stimulating effect on milk production . An analysis of medical data from women giving birth outside of hospital in the USA (n = 23 242) revealed that placentophagy was not associated with adverse effects in the neonate; admissions to hospital or neonatal critical care and deaths were considered in this analysis . The risk associated with ingesting oneʼs own placenta following a spontaneous, non-interventional delivery without long-term pharmacological treatment during pregnancy is relatively low . Depressive disorders are the most common postpartum psychiatric manifestation, though this is not to be mistaken for the “baby blues” of postpartum depression (PPD) . The latter is not only a peripartal health risk to the mother but will also lead to diminished health in the child . The acute withdrawal of the significantly increased amounts of circulating (neuro)hormones around the time of parturition and the sudden cessation of hormone synthesis by the placenta is suggested as a cause for the emotional imbalance . To counteract the fluctuations in the reproductive hormones, allopregnanolone, a progesterone metabolite, is substituted as a therapeutic approach to postpartum depression . As small quantities of progesterone are detectable in both raw and dried placenta, ingestion could likewise exert an effect on the mental health of the mother. Hence, the indication for puerperal application of oneʼs own placenta as a hormonal substitute may be derived in the case of prior postpartum depression or pronounced premenstrual syndrome with marked mood swings. It is debatable, however, whether the hormones become biologically available after intake as steroid hormones are poorly absorbed when taken orally. Concentrations of 18.76 µg/g of progesterone-active substances have been measured in dried placenta . The dose of 1 g placenta powder three times daily recommended by birth attendants (doulas, midwives)  contains an average of 56.3 µg of progesterone-active substance. A much higher concentration of human placetal lactogen (hPL) is found in raw placenta, namely a mean value of 17.58 mg/g . A stimulatory effect on milk production and early onset of primary lactogenesis has been reported . Even if the described effects of placenta ingestion were attributable to a placebo effect , mother and child could in certain cases benefit from improved well-being and better health while being exposed to a low individual risk . Placental tissue is a source of natural hormones, trace elements and essential amino acids – the ingestion of raw or dehydrated placenta could influence postpartum convalescence, lactation, mood and recovery. The risk of intoxication from individual intake appears to be low in terms of microbiological contamination and the content of potentially toxic trace elements. However, the mother should be advised that the processing and use of the placenta is her responsibility and that the transmission of infections cannot be ruled out. Further studies focusing on the bioavailability of the hormones after oral ingestion and their potential physiological effect are necessary to evaluate the use of placental preparations. Patients with an interest in placentophagy should be informed about the potential risks and effects. Sophia K. Johnson, Jana Pastuschek, Jürgen Rödel et al. 21 Benyshek DC, Cheyney M, Brown J. et al. Placentophagy among women planning community births in the United States: Frequency, rationale, and associated neonatal outcomes. Birth 2018; DOI: 10.1111/birt.12354. 24 Pan S, Chan M, Wong M. et al. Placental Therapy: An insight to their biological and therapeutic properties. J Med Therap 2017; DOI: 10.15761/JMT.1000118. 34 Gesner JAM, Burchard D. Pharmacopoea Wirtenbergica: In Duas Partes Divisa, Quarum prior, Materiam Medicam, Historico-Physico-Medice Descriptam, Posterior, Composita Et Praeparata, Modum Praeparandi Et Encheireses, Exhibet. Iussu Serenissimi Domini Ducis Adornata, Et Pharmacopoeis Wirtenbergicis In Normam Praescripta 1741. Abb. 1 Möglichkeiten der Plazentaverarbeitung und -einnahme sowie mögliche Risiken und potenzieller Nutzen von Plazentophagie.